Buko Pandan is a favorite among desserts in most Filipino parties. The fragrant smell of pandan is soothing after a filling meal. 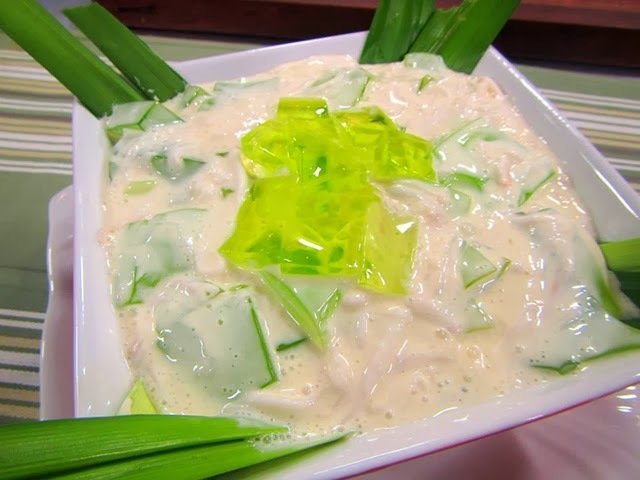 Buko pandan dessert is traditionally made using agar-agar but we use boxed pandan-flavored gelatin instead. 1. Prepare gelatin according to package directions, but add sugar and pandan flavoring. 2. Transfer to a square glass dish and set aside. 3. When gulaman sets, cut into cubes. Then, combine with coconut, cream and milk. 4. Chill and garnish with pandan leaves. You can also add a scoop of Vanilla ice cream for that luscious taste.